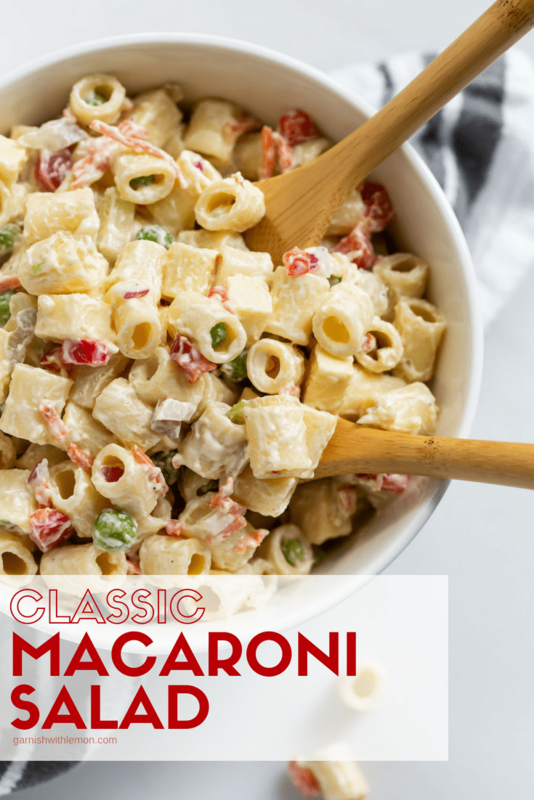 No one can resist a Classic Macaroni Salad recipe. This creamy comfort food is the perfect side dish for any backyard BBQ, picnic or potluck! There are a lot of ways you can fancy up macaroni salad. Add arugula, toss in tuna, sprinkle it with smoked paprika…You get the idea. But sometimes you just crave the tried and true. And this creamy, Classic Macaroni Salad recipe tastes just how I remember it as a kid – straight up goodness with no fanciness necessary. What ingredients are in a Classic Macaroni Salad? Now some may disagree with me, but in my opinion, you can’t have macaroni salad without cheese. Those tasty nuggets of cheddar cheese are non-negotiable. 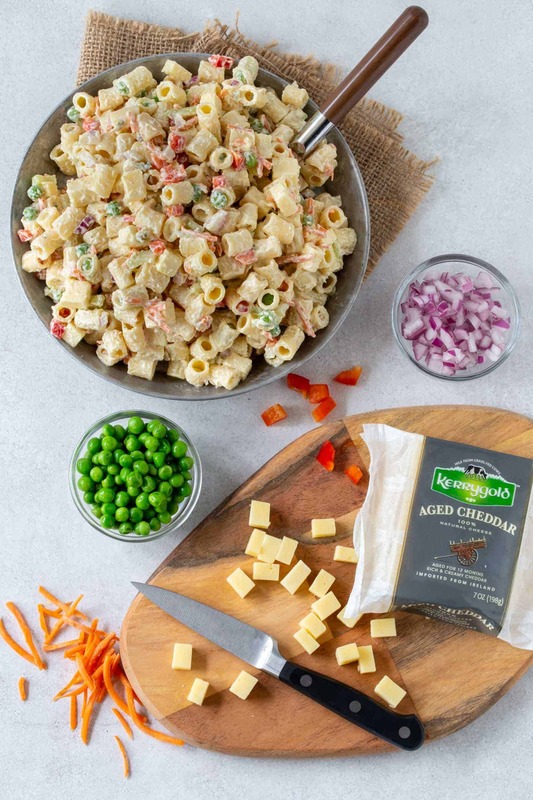 Of course, we used our favorite Kerrygold Aged Cheddar Cheese in this macaroni salad recipe for its rich flavor and creamy taste. Another non-negotiable? Sweet green peas. Not only do they add a lovely pop of color, they are a fantastic pairing with the pasta and cheese. I used frozen green peas from the store. They defrost quickly and there is no shelling required. The rest of the veggies in this salad are a result of what I had left in the refrigerator, so feel free to add or subtract your favorites. I like shredded carrots, crunchy bell pepper and celery bites and snappy red onion in my Classic Macaroni Salad, but swap in whatever tickles your tastebuds. I tested a number of macaroni salad recipes before arriving at this version, and the dressing was never right for me. There was either too much mayonnaise, too much vinegar or too much mustard. I swapped in sour cream for some of the mayonnaise, and that helped add some tang to the dressing. But then I hit upon the ingredient that changed it all for me: pickle relish! A nominal amount of pickle relish and pickle juice were game changers for me. It took an average macaroni salad from good to great in a hurry. 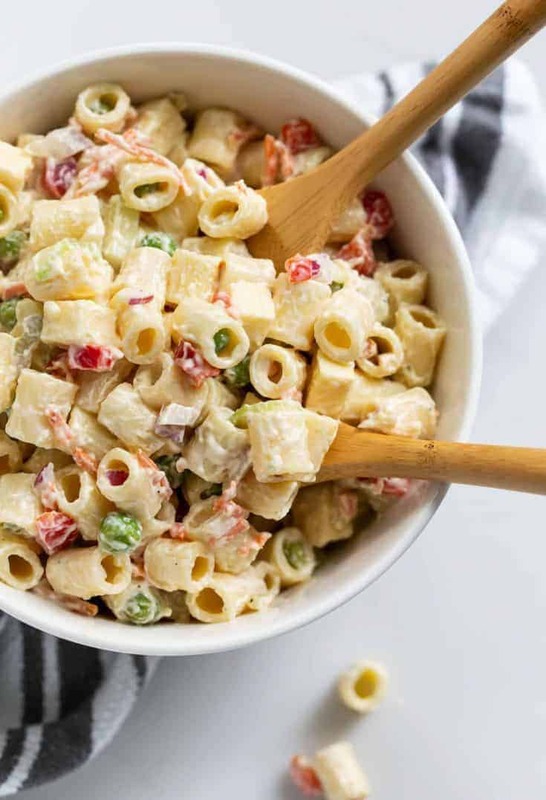 The beauty of this Classic Macaroni Salad recipe is it goes with nearly anything off the grill, making it an ideal side dish for any backyard BBQ. Main courses: These Grilled Italian Sausage Wraps are on heavy rotation for us during the summer as are these Grilled Lamb Burgers with Goat Cheese and Tzatziki. Sides: Other side dishes that go well with this Classic Macaroni Salad are this Easy Broccoli Salad with Bacon and Cheese and this Antipasto Salad with Red Wine Vinaigrette. Sweets: Dessert is usually a make-ahead recipe like these simple Cheesecake Stuffed Strawberries or this S’mores Ice Cream Cake. However you serve this Classic Macaroni Salad recipe, rest assured this is crowd-pleasing comfort food at its best. Looking for more macaroni salad inspiration? Check out some of these other tasty pasta salads! Prepare pasta according to package directions. Immediately rinse with cold water and set aside to drain. Combine mayonnaise, sour cream, mustard, pickle juice and relish in a small bowl. Season to taste with salt and pepper. Add pasta, dressing and remaining ingredients to a large bowl and stir to combine. Refrigerate for at least 2 hours before serving.